You can see a wide range of Easter treats with the top brands like Cadbury dairy milk, Maltesers, Lindt, and more favourite ones. Coles Catalogue is an online source to find great seafood for Lent as well. Shop your weekly needs like fresh-cut meat. Australian quick cook porterhouse or Scotch fillet steak will cost only $5.50. That's one of the great examples from this catalogue. Find 4 products at half prices on the cover page. You'll be able to purchase Doritos corn chips for only $1.65! Traditional bakery products like Hot Cross Buns are at lower prices as well. Purchase them for only $3.50/pk. 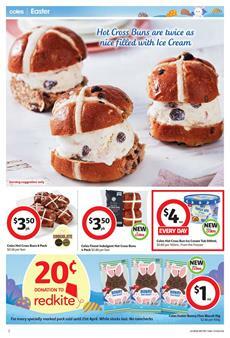 Browse pg 3 for Cadbury Easter bunny, milk hunting bucket, elegant rabbit, Maltesers, and more candies or treats. Find classic chocolate brands like Ferrero Rocher on the same page. Canned fish variety like John West tuna chunk style is available on pg 4. On pg 4-5, you can see the details of seafood for Lent, too. Fresh salmon skin on portions will cost $26! Buy the most popular treats, fresh produce, and save on all the Easter products. Many more categories including more Easter products are available in the catalogue. Browse the currently available Coles Catalogue that contains the deals that are valid starting on 10 Apr.